Ed from Shaun of the Dead is a great character to assume for cosplay, costume event or Halloween party. As Shaun’s best friend and co-zombie slayer, Ed is one of the most popular characters in any Zombie Movie combining a great sense of humour, over the top relaxed irreverant style and unique style of dress. The clothes that Ed wears throughout the movie are instantly recognisable, easy to put together and very comfortable to wear. If you are planning to attend a costume event dressed as our unlikely hero, sidekick, zombie-slayer Ed, it is essential you get your hands on an “I have Wood” T-shirt, as sported by Ed throughout the movie. “Not Just Nerds” have come up with an excellent shirt that closely resembles that worn by Ed. This shirt is a professionally printed 100% Cotton Ring Spun pre-shrunk Jersey knit T-Shirt. The words “I got wood” are emblazoned across the chest in a contrasting color on a backdrop of trees. 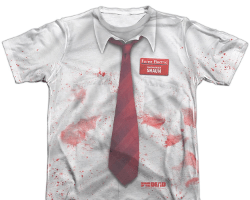 Unlike many “Ed” shirts you will not see a “Shaun of the Dead” logo underneath, so it will look authentically like the shirt worn by Ed in the movie. This shirt comes in a range of sizes from Small to X Large and is a premium quality t shirt. Ed adopts a relaxed style in everything he does and his choice of clothes is no different. These three quarter length cargo capri shorts in army green are ideal for putting together an Ed ensemble. With an elasticated waist for comfort, the 100% cotton fabric will ensure they are lightweight, cool and can be machine washed between cosplays events. The straight, loose fitting legs capture Ed’s style of dress perfectly. Ed may not be the most sartorially elegent zombie slayer on the planet but when it comes to chosing appropriate footwear, he is spot on. These chunky white trainers are extremely comfortable and delightfully eye catching. The high sides and traditional Nike tick closely resemble those trainers worn by Ed whilst on his zombie hunting adventures with Shaun. These white Nike Jordan Men’s AJ1 KO High OG Basketball Shoes have a solid rubber cupsole for cushioning and impact protection which will ensure comfort throughout your Halloween Party, comic-con event or zombiefest soiree. The soles and trim are red, as is the Nike Tick. Aswell as being the ideal trainers to complete your Ed costume, they also make a practical pair of shoes for recreation and sport having been designed to the high standard that is synonymous with Nike. When Shaun and Ed first learn how to defend themselves from the zombies, Ed’s weapon of choice from the shed is a garden shovel which proves very effective. Carrying a garden shovel around all evening at a Halloween party or any event is not a great idea, so for a humerous twist on Ed’s weapon we suggest a fitting substitute would be this Halloween Prop Shovel. Let’s face it, if anybody can carry it off, Ed can! This Halloween prop shovel is made from hard foam and fashioned to a deluxe finish. At a modest 24 inch length (60cm), this prop shovel is suitable for both adults and children. With fake blood spatters covering the sharp end of the shovel, it will instantly provide the finishing touches to your Ed from Shaun of the Dead costume. As an alternative to friendly Ed, you may want to consider “zombie Ed” as your cosplay of choice. During the battle at the Winchester Pub, Ed is bitten by two zombies, one of whom is Pete, a former friend and flatmate of Shaun. Post zombie apocalypse, Shaun once again finds house room, or rather, shed room for his best friend and co zombie slayer. A keen video gamer, Ed is seen at various times throughout the movie playing a PS2 game called Timesplitters 2. Our final shot of the dynamic duo is Zombie Ed and Shaun in the shed, resuming their dimension hopping zombies game. Business as usual! To transform your Ed ensemble into zombie Ed, add a set of neck and wrist chains, a PS Controller and some convincing Zombie Makeup. Plastic, lightweight & very realistic. These wrist and neck shackles in siver and black make an ideal addition when putting together a costume for Zombie Ed from Shaun of the Dead. These shackles are a fun prop that would make a versatile addition to any number of costume carnivals, Halloween haunts, ghostly gatherings or prisoner parties. They can put the finishing touch to any zombie costume for an added dramatic twist. Constructed from plastic, these shackles are lightweight and look very realistic. Measuring 41 inches in length (104cm), the neck brace, wrist cuffs and connecting changes can be worn in comfort with a sufficient freedom of movement. Add a set of these shackles to complete your Zombie Ed Cosplay. Compatible with PlayStation 2 Gamepad. Even after Ed becomes a zombie, he still maintains his love of playing video games. In the final scene we see Shaun and Ed resume their PS2 game Timesplitters 2 which includes a challenge section about zombie slaying. A great prop for zombie Ed would be a PS2 controller. This is a great little compact kit of makeup that contains everything you need for creating the zombie Ed look. Blending the colors in the pallete will give Ed that nice green hue to his skin and a generous amount of black around the eyes will give that sunken, dead look. Now add some fake blood sprinkled generously to reflect the wounds Ed sustains during the great Winchester zombie stand-off. Gel your hair to look spikey and snap on the chains and there you have it: instant Zombie Ed in the shed! If you are looking for ideas for a couple costume, the characters of Shaun and Ed make a great pairing. For a step by step guide to building Shaun’s costume check out our Shaun of the Dead Costume Guide. We also have some great Shaun of the Dead Merchandise.